From October 2013, Universal Credit was introduced to bring together a number of working-age benefits including Housing Benefit, Income Support, Job Seekers Allowance, Income Related Employment and Support Allowance, Child Benefit and Carer’s Allowance (income related). It is being phased in over a number of years starting with new claimants or those with a change of circumstances. If you are on Universal Credit, your housing costs will be included in your monthly payment. 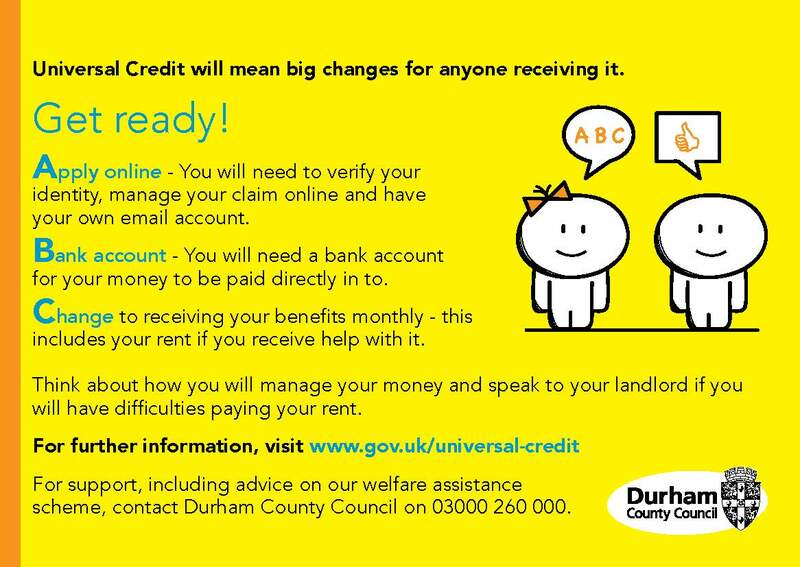 If you’d like more information on Universal Credit, or to find out if the changes could affect you, please get in touch. Universal Credit is being fully rolled out across Darlington and Stockton and Thornaby from June and July 2018. Before you apply for Universal Credit, you’ll need to gather some Information together. This will help make sure you only have to do the application once, and help you to get Universal Credit as quickly as possible if you’re eligible. Details of any other benefits you’re getting, i.e. what benefit and how much you get.